I first met Anders Schepelern in 2009. Anders is passionate about copyediting and writing in general. When expressing yourself in writing, proper language is important as it not only enhances the message you are trying to get across—it also greatly reflects on you as a person and/or the company you are writing for particularly if something is not quite right. There is a lot of new content produced every minute around the world and a lot of it is in English (around 40%)—or something that resembles English, anyway. The fact is, a lot of the English content created is done by people whose first language is not English (myself included), and the problem is not about spell checking—it is about mastering the language and getting the right message across. Having been involved with digital content for many years, I was fully aware of the challenges of producing quality content and was, therefore, hooked immediately when Anders Schepelern introduced me to Wordy and invited me to become a part of the company in 2009. 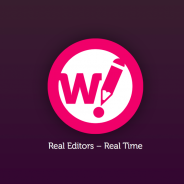 Wordy, in a nutshell, is crowdsourcing the copyediting role to editing professionals (real human beings—not an algorithm or robot) around the world—all pre-qualified by Wordy. In fact, the average Wordy editor has eight years’ experience. Eleven percent hold a PhD, 7% an MSc, 24% an MA, 25% a BA and 9% a BSc. The process is really simple. Just upload the documents or even paste the text in the form on Wordy.com and, once you have selected the industry style (there are more than 50 of them), you will get a price for the particular job. Once a job is submitted, you will be notified as soon as an editor has accepted it, and you are even able to communicate with the editor working on your project for clarifications, etc. Considering the embarrassment or misunderstanding that just a few wrong or misplaced words can cause, I find Wordy indispensable when publishing articles for the public or when making presentations or business proposals of any sort. Then again, I am, of course, biased being an investor in Wordy, but I urge you to give it a try. I am sure you will not regret it. The “worst” thing that can happen is that an editor cannot find a single mistake in your content, in which case you have the comfort of knowing that a second set of eyes has seen it before you publish.